→ Endurance damage increased to 2 from 1. Nice to see detailed patch notes, but wheeeeere's the launch. Large update coming today/tomorrow. They're adding real time friendly arena battles but only with random people for now. Another update being released tomorrow, looks to be a lot of balancing stuff rather than any new features but some of the changes seem quite drastic. The game may restart once the data patch is released. We would like to apologize for any inconveniences may have caused due to this patch. - Modified the drop rate of Soul Stones in normal stages. - Increased the quantity of Soul Stones dropped in boss stages. - Changed the type of Soul Stones dropped in boss stages. - Revised HP, Defense and Attack Power stats depending on the natural grade. > Skylanders of higher natural grade gets increased MAX HP. > Increased the Attack Power of Nat. 5★ Skylanders and decreased the Attack Power of 1/2/3★ Skylanders. > Skylanders of higher grade will have better Defense efficiency (by level) than those of lower default grade. - Decreased the amount of Wish Stones given from weekly mission. - Decreased the amount of Wish Stones given from adventures. - Removed Wish Stones from the Realm of Souls and Distorted Dimensions. - The Realm of Souls will now have 6 floors instead of 8 floors. - Only 3 - 5★ Soul Stones will drop from the Realm of Souls. - Changed the amount of Energy required to enter from 10 to 8. - Changed the amount of Gems required to recover characters. - New effect [Rejuvenate] has been added. → It's an exclusive effect for Villains. This effect continuously heals in proportion to target's max HP whenever the count goes down. - The event ending date will be modified as below. - Storm Strike: Increased the damage. 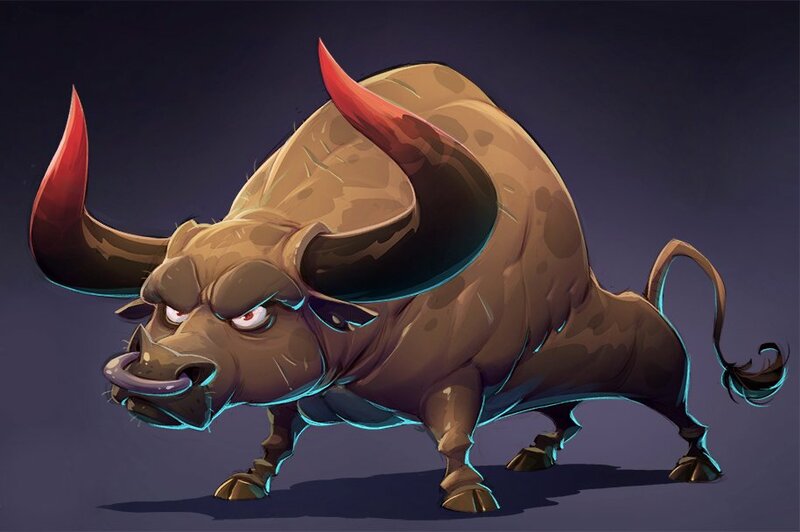 - When in Storm Beast form, all skills will deal greater damage as his Endurance is lower. - When in Storm Beast form, gains [Evasion UP] for 1 turn. - Crustacean Combo: Increased the skill cooldown time and decreased the [DEF UP] count. - Bird Call: Increased the heal power. - Squid Squabble: Increased the first attack damage. - Squid Pistols: Increased the skill activation chance from 30% to 100%. - Whale Tale: Increased the skill activation chance from 50% to 70% (100% when fully upgraded). - Green Thumb: Decreased the skill activation chance and heal power. - Garden of Pain: Decreased the [DIMINISH] count from 5 turns to 3 turns. - Missile Rain: Decreased the [CRIT RATE]. - Traptanium Cannonballs: Decreased the [ATK DOWN] count from 2 turns to 1 turn. - Solar Flare: Decreased the [DEF DOWN] count from 2 turns to 1 turn. - Sunrise: Decreased the [EXPLODE] count from 3 turns to 2 turns. - Shark Skin: Decreased the [ATK UP] count from 3 turns to 1 turn. - Dye Hard: Decreased the [DEF DOWN] count from 2 turns to 1 turn. - When in Beast Form, decreased the [EVASION UP] count from 2 turns to 1 turn. - Deadly Clothesline: Decreased all allies' [ATK UP] count from 2 turns to 1 turn. - Flame Breath: Decreased all enemies' [DEF DOWN] count from 3 turns to 1 turn. - Abra-Ca-Dabra & Juggling Act: Changed the skill cooldown time and the mana consumption amount. - Wish Blades: Increased the initial activation chance from 40% to 60%. - Wish Blades: Decreased the skill level-up increasing ratio from 10% to 5%. - Fistful of Shakes: Decreased the [CRIT RATE UP] count from 3 turns to 2 turns. - Spinning Slash: Increased the [CRIT RATE UP] count from 1 turn to 2 turns. - Frost Combos: Increased the [ATK DOWN] count from 1 turn to 2 turns. - Traptanium Boomerang: Increased the [DEF UP] count from 1 turn to 2 turns. - Ground Grinder: Increased the [ATK DOWN] count from 2 turns to 3 turns. - Universal Time: Increased the activation chance of [HEAL] from 60% to 100%, and decreased the heal power. - Universal Time: Changed the skill power-up Lv. 4 from [Heal] effect activation chance +10% to [Heal Power +15%]. - Chains of Fire: Changed the skill effect from having 50% chance to increase [BLOCK RATE] to having 50% chance to gain [FOCUS AGGRO] for 1 turn. - Searing Slam: Changed the skill effect from having 50% chance to gain [FOCUS AGGRO] to having 50% chance to grant [BLOCK RATE UP] for 1 turn to all allies. - Direct Current: Increased the skill activation chance from 80% to 100%. The skill will be used on the enemy with the lowest Endurance. - Feather Barrage: Increased the [ACC DOWN] activation chance from 30% to 100%. - Laser Painter: Decreased the damage and has a 50% chance to regain Mana additionally. - Wing Whip: Changed the skill effect from granting [remove debuff] on an ally to all allies. - Under the Cover of Darkness: Increased the basic skill activation chance from 50% to 80%. - Under the Cover of Darkness: Changed the skill power-up Lv. 5 from Effect count +1 to Effect activation chance +5%. - Splintering Punch: Changed the skill effect from having 50% chance to gain [ACC UP] to having 50% chance to attack the target additionally. - Double Snake Attack: Decreased the mana consumption amount by 1 and skill cooldown time by 5. - Restless Reptiles: Changed the basic activation chance by 80%. This can be increased up to 100% with skill power-up. - Wing Slice: Removed the [ACC DOWN] effect and increased the damage. - Wing Slice: Changed the skill power-up Lv. 3 from [ACC DOWN] effect count +1 to [ATK +10%]. - Mode Toggle: Changed the [ACC DOWN] to [CRIT RATE DOWN]. - Zeroing In: Fixed an issue of having no effect when powering up the skill. - Diminish: Increased the factor based on Attack Power from 8% to 10%. - Poison: Increased the damage in proportion to current HP by 5% to 7%. - Fixed issues with translations of multiple languages. - [Spitfire - Flame Fury] Fixed an issue of skill activation chance decreasing with skill power-ups. - [Gusto - Breath of Life] Fixed an issue of Gusto healing himself more than his skill description. - Additional game tips have been added in game data download loading screen. - Explosion Immunity and DMG per Endurance have been added in collection filter. - Enemy Villain’s secondary stats (Accuracy, Evasion etc) will increase depending on level, while initial secondary skill will be decreased. - The cost of some items has been balanced. - The amount of EXP the characters gain from boss stage in Adventures has been upgraded. And now an event to get a free 5* Skylander if you play the friendly arena five times in a day five times (no need to win those matches). Runs for two weeks until the 21st of February. I pity the players about to see an influx of Starcast in PVP. And they've now given us the 28th of February as the intended release date. ...Huh, that's the same release date for a lot of other mobile games currently in Oceania only. This time it's probably for real, then. i hope it's for real! Weekly Missions and Monthly Login will be improved and reset via next update. - Weekly missions will be modified and rewards will be changed. - To implement the change, weekly mission progress of all Portal Masters will be reset. - Rewards you claim from the monthly Login will be modified. - To implement the change, the Login progress of all Portal Masters will be reset. We are preparing to give out rewards as compensations for inevitable progress reset. Further details will be notified via update notice. Officially released in the US. I also noticed that some swapped attack names are still there but eh that's low priority for them. I got Splat, so I’m satisfied until I get Wildfire. The game is a lot of fun and the new changes are very good. I hope I still play it for a long time. I never got a notification from the play store because the pre-reg version of the app is apparently different from the one that's available. Will I still get the prereg perks by downloading the new one? I just looked for it on the play store and didn't check if it was the prereg one, I still got the gifts. Stream from the devs currently going on. I missed some stuff but Malefor and new Skylanders are still in development. Are the Doom Raiders not playable anymore? Nope, the dev stream said something about why they were removed, but I wasn't paying attention at the time. Something about a later update, most likely because you could get Luminous before Eye Five if you played your RNG cards right. I'll actually rewatch their stream while I'm working, I'll see what they actually said. -No plans for Bluetooth portals, ever, because of its avaliability when they came out. -Nothing about the doom raiders, actually, but Puffyhuff implied that Luminous in the game was unintentional. Can’t wait too see what kind of new skylanders are they going to come up with...I feel like their art design style is very different from TFV and VV and I love that !! I mean look at nefarian he looks amazing. I kinda hope for a contest just so we can have our Undead Spider or Earth Sand Skylander already. If Activision won't do it, the community better do. Guild Invasions and a new mission book to replace the Hugo one, I think. There's Dark's guild, he posted it on another thread. I have my own for the Skylanders Wiki stuff but don't expect any pro play there, no one has even broken B score in Invasions yet. But it's fine, it's just so I have a reliable place to get Guild info at. New update incoming bump! Meditation Woodland is a new Challenge Area for XP gain, and some Skylanders got buffed/nerfed. My boy Wham-Shell went from risky to useless ;___; 19s cooldown is cruel. Summoners War people are saying this is normal for com2us to nerf every farmable character which is kiiinda a bad sign. Steam is currently live! I'll edit with any important QA stuff. -Doom Raiders were removed in the full release for reasons unknown to the community managers. -Two characters per month currently, new ones being teased soon. -Community managers have no control over nerfs, so no point in taking it out on them. -No Bowser, no DK, they're sure they'd never be allowed to. -Even if the series returns, Com2us Skylanders might be too much legalese to bring over to a main game. So you’re saying there’s a chance. Nice. They didn't quite say that,no. Okay so they 100% confirmed new characters, cool I'm looking forward to it. Say, how does one sell runes? I've been trying to figure it out but when I view them from the Skylanders screen, it only gives me the option to Equip or Power-up? There's a select button on the bottom of that box, you use that to mass sell runes. I don't get it cuz in the beta you could sell directly from the inventory. It's a little harder to see dupes in that tiny space. edit: is every single character male to some players, I was looking at discussion and now I'm seeing Stormblade, miss legs for days, being called a guy. Yeah storm blade has a feminine face and body I don’t see how people can mistake her for a dude. Dang, I three starred Nightshade really fast! For all of the advice to never rely on 5 star Skylanders, Astroblast is proving that wrong - even if his AoE isn't active, that 1-mana kick is a swiss army knife. 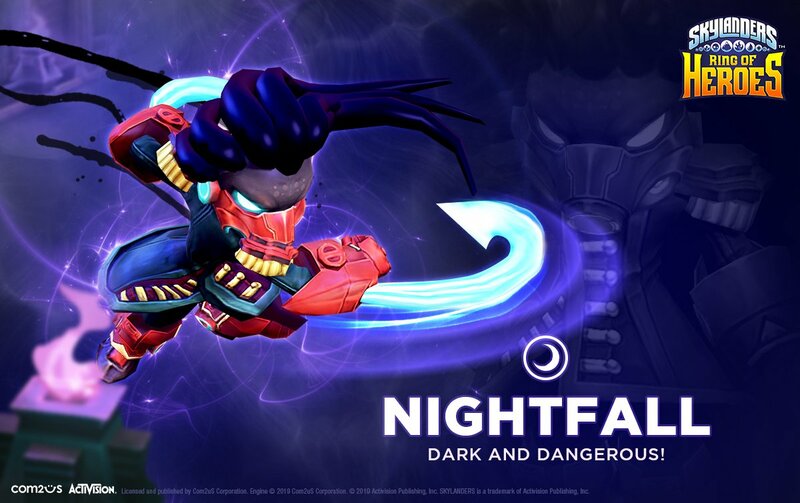 Nightfall is a 4-star Expert character that casts Diminish and uses attacks that work with Diminish and crits. 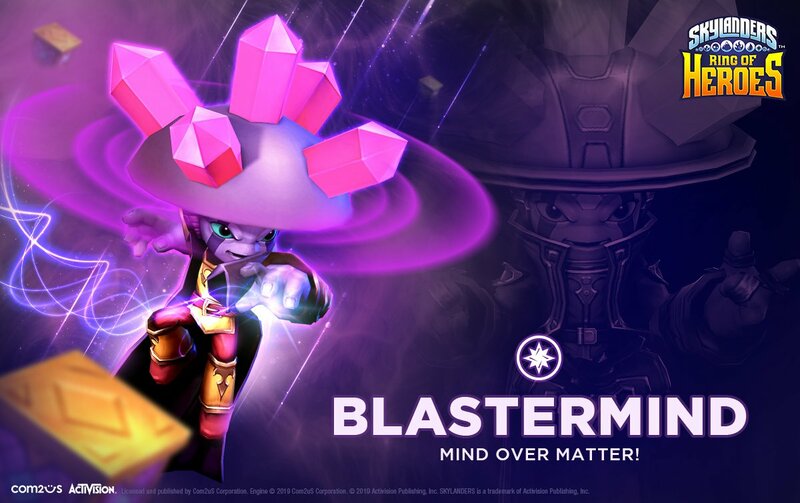 Blastermind is a 5-star Support with AoE healing and attacks. I'm sure people will be angry that Mysticat got nerfed but holy **** he needed it. Nearly untouchable if you didn't attack him first. So who else is enjoying the existence of the episode dungeon? I'm a bit worried I won't be able to complete Normal though, my strongest are only at 40, and I'm imagining the final stage will be beyond what I can reach in quick time, even with the exp forest. I LOVE IT, inject this lore directly into my game, delicious. And yeah, average lv 40 is too little for Normal, I'm having trouble with the final Leviathan at 50 (let alone 3-starring some of those places plagued by Light Bad Jujus). Hit up the Meditation Woodland if you have the energy, it's worth getting those extra dark stones! edit: Episode Dungeon closed, and I finished the main story. Who'd think using Nightfall as a meat shield so Luminous wouldn't use shields was all I needed. 1.0.8 on Thursday next week that'll add the Hall of Chaos and brings back from the beta the ability to use Doom Raiders as your villains.